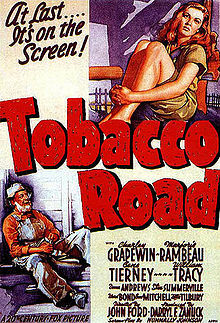 In Georgia, near to the Savannah River, the lazy and crook hillbilly Jeeter Lester lives in the Tobacco Road with his wife Ada, his son Dude and his single daughter Ellie May in a very poor condition. When the bank decides to take over his land, the banker George Payne is convinced by his friend Capt. Tim Harmon to lease the land to Jeeter for US$ 100.00 per year. Jeeter plots a means to loan the amount from the widow Sister Bessie Rice that has just received U$ 800.00 from the life insurance company. However, Bessie decides to get married with Dude and uses the money to buy a brand new car for Dude. Jeeter plots a means to sell her car while he tries to marry Ellie May with his son-in-law Lov Bensey that was left by his wife.